When NYPD Detective John Shaft (Samuel L. Jackson) investigates the killing of Trey Howard (Mekhi Phifer) by the rich, racist socialite Walter White Jr (Christian Bale), his case is torpedoed when the sole witness is intimidated into going into hiding. A furious Shaft quits the police force to bring White – now allied with Dominican drug kingpin (Jeffrey Wright) – to justice by any means necessary. I am never quite sure what to make of Shaft. The original film, released back in 1971 and rode the crest of America’s ‘blaxploitation’ wave of low-budget pulp films featuring predominantly African-American casts and funk and soul soundtracks. They were ground-breaking at the time, and carried a lot of sociopolitical weight. It seems unlikely that this 2000 effort (it’s not quite a reboot and not quite a sequel) carries much of that weight, despite having a large number of African-American actors in the cast, John Singleton directing and a story based around a hate crime. Instead it feels weirdly artificial and manufactured. 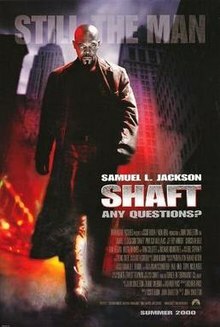 The blaxploitation films of the 1970s represented a minority culture and challenged preconceived notions of popular entertainment; Shaft (2000) simply feels like popular entertainment. Part of what makes the film struggle is that blaxploitation was a response to a problem – a dearth of representation of African-American culture in American cinema – that arguably became a problem of its own – a crude stereotyping of a culture into pimps, drugs and criminal gangs. The makers of Shaft clearly recognised this, but their response is a weird sort of half-hearted signalling in the direction of blaxploitation while still keeping one feet planted firmly in safer and more upstanding territory. The film’s story is not just safe, but actively dull. It plays on stereotypes and keeps things very predictable and superficial. What makes it at least broadly enjoyable are the performances. Clearly there was no actor better suited to the pulp 1970s roots of the Shaft movies than Samuel L. Jackson, and while he is never taxed by complex material he is at least making things awfully fun for the audience. It is a very big and obvious example of a film studio simply giving the audience what they want. Christian Bale sleep-walks through a role as a preppy violent racist: there are visible overtones of his parallel performance as Patrick Bateman in American Psycho (also 2000), but in that film he does superb work whereas here he is fulfilling a simple audience need for a villain at which to boo and hiss. Tony Collette is similarly wasted as the sole witness to the initial crime. She performs a function, but that is about the extent of it. Much more interesting is Vanessa L. Williams as Shaft’s no-nonsense colleague Detective Carmen Vasquez. She plays the role as a cool professional, and lifts every scene she’s in as a result. Of course there’s only so much room for a female cop in a film titled Shaft, but when she’s present she’s a real asset. The real highlight is Jeffrey Wright as the eccentric and volatile drug kingpin Peoples Hernandez. He’s a mercurial, unpredictable figure, and you can see Wright taking advantage of the character to create something genuinely fascinating and unexpectedly threatening. Wright has always been an excellent actor. Here he provides a performance worth more than the film in which he appears. Wright, Williams and Jackson may lift the film to an enjoyable level, but they would all have been better off starring in a more interesting feature than this. Strip off the dressing and Shaft is just cold, mercenary, commercial entertainment. It will scratch an itch for a generic police-based action movie, but it won’t satisfy any further than that.